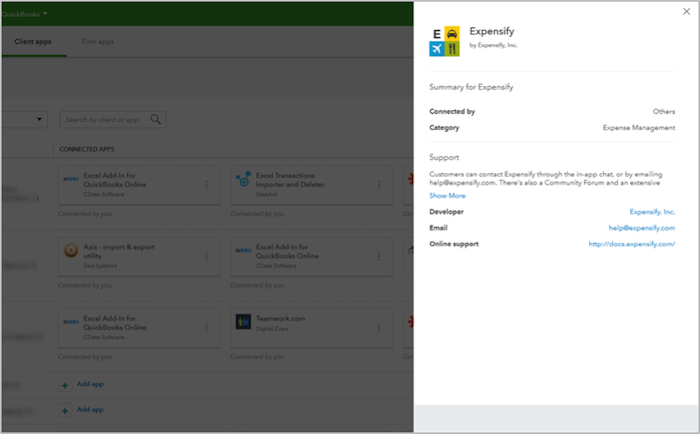 Managing apps connected to your clients’ QuickBooks®Online companies just got easier! 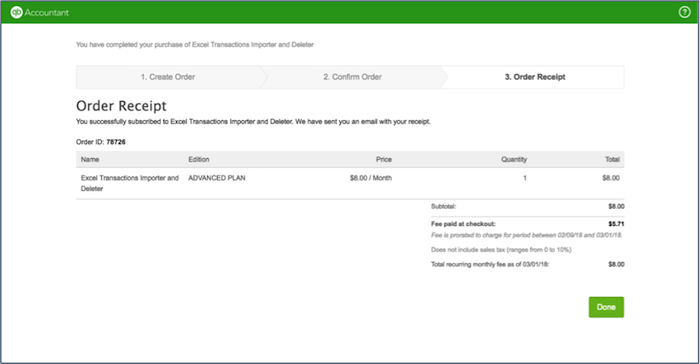 Last month, Intuit® updated the Apps® tab in QuickBooks Online Accountant (QBOA) to give accountants better visibility and control of the apps connected to their clients’ accounts. This new functionality includes a streamlined, high-level view of all apps connected to a client’s account, combined with easier navigation to view and manage detailed information about the app connection. I love this new view because it gives me quick access to monitor and manage all the apps connected to my clients’ QuickBooks companies on one screen. Let’s take a peek! The new Client apps page in QBOA now lists your clients’ apps in a convenient grid view. This new layout allows you to see all apps for all your clients in one screen. 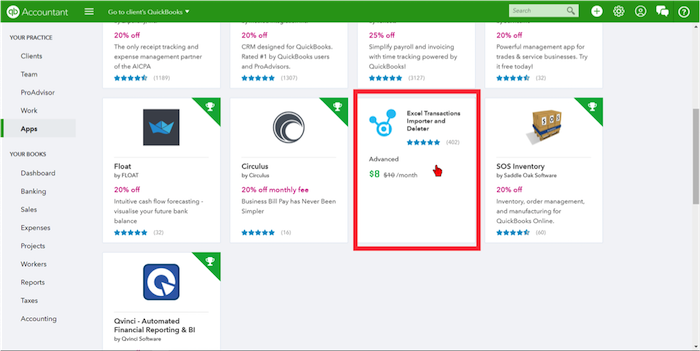 The grid lists the client name on the left and displays all apps connected to their QuickBooks account on the right. 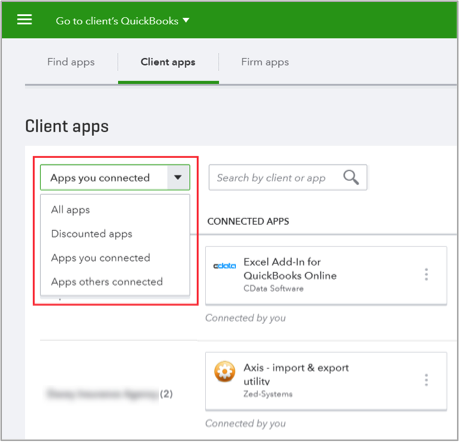 The number of apps already connected to the QuickBooks account is displayed next to each client’s name, and you can easily see whether the app was connected by you or by another user by looking directly underneath the app card in the grid. The filter function helps you to easily to view only clients that are subscribed to either discounted apps, apps you connected or apps others connected. This can be super helpful when auditing your clients’ app subscriptions to see which apps were connected by the firm and which were connected directly by the client. 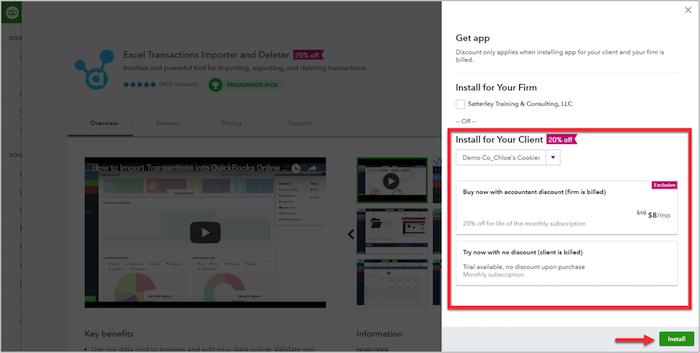 This is also a great way to quickly determine if you have clients using apps that are part of the new QuickBooks Accountant Apps program, which offers discounts to accountant users on some of the most commonly used apps in the Apps Center, introduces consolidated billing for all program apps andallows you to add the subscription fees to your existing wholesale billing account right inside QBOA. We’ll learn more about the apps program later in this article! 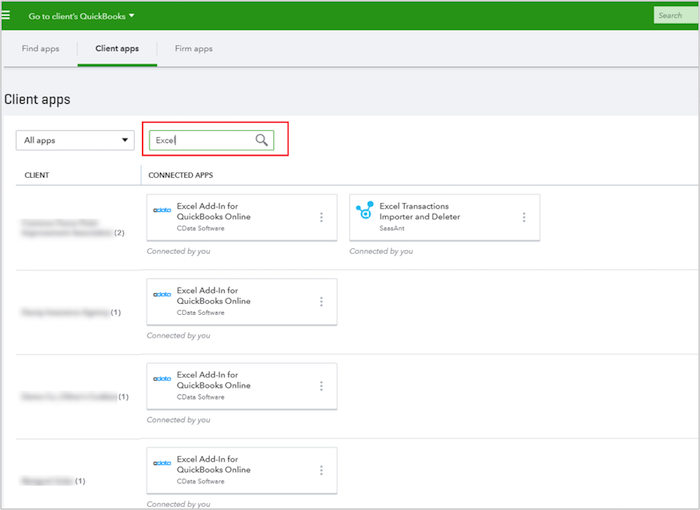 Use the search box to identify which clients are using a specific app. Just start typing the name of the app you are looking for to see a list of all clients who have the app connected, displayed below. The redesigned apps tab also provides better visibility into client details and app management for accountant users. Type a client’s name into the search box and you can view the details for that client only. 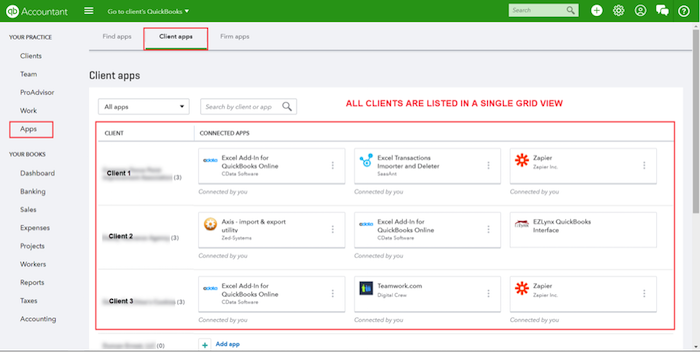 This new functionality makes it easier than ever to see what apps are connected to a new client’s QuickBooks during the onboarding process, an essential step in understanding your client’s processes and technology workflows. You can manage apps that were connected by you by clicking on the three vertical dots to the left of the app card. You can launch the app, view support options, disconnect the app from QuickBooks or rate your experience with the app by writing a review to be included on apps.com. If an app was added as part of the Accountants App program, you’ll also be able to view and manage subscription information here. If the app was added by another user, you can still view support information for the app, including contact info and a link to the developer’s support website. I’m really excited about this new layout and how easy it is to view and manage client apps and would love to see additional features added here in the future, such as the ability to view when an app last connected to QuickBooks and maybe a link to a filtered view of the audit log, showing all data recorded and modified by the app! Another big change to the way accountants manage apps for clients is the launch of the QuickBooks Accountant Apps program. The program was launched in late May 2018 and offers accountant users the option to buy subscriptions at a discount of up to 25 percent, when adding program apps to their clients’ companies through QBOA. Apps included in the apps program currently include: Expensify, Method:CRM, TSheets by QuickBooks, ServiceM8, Float, Circulus, Excel Transactions Importer and Deleter, SOS Inventory and Qvinci, but more of our favorite apps partners will be joining the program in the future. 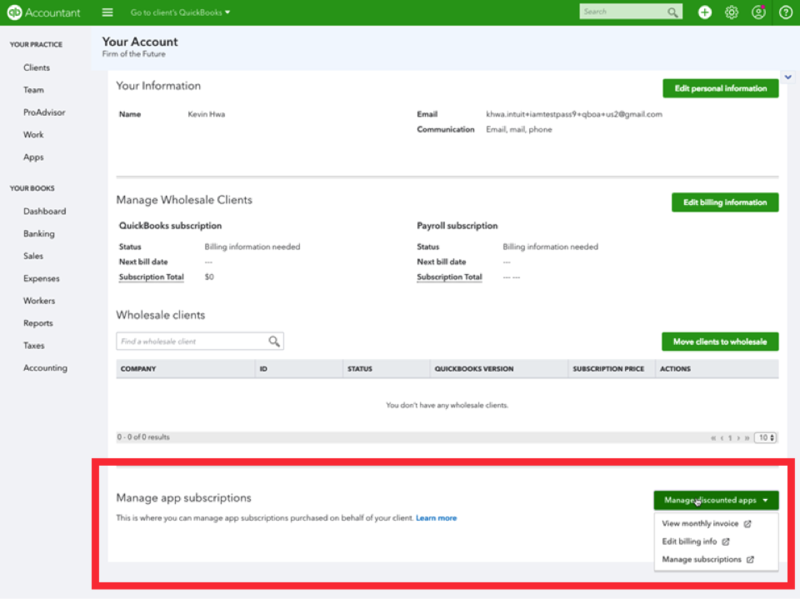 To add an app to your wholesale billing account, follow these easy steps! 1. From within the Apps tab, click on the app you’d like to add. 2. Click Get app now. 3. Under Install for Your Client, select your client from the drop-down list. Notice that the wholesale pricing will be displayed. Click on Buy now with accountant discount (firm is billed), then click Installat the bottom right of the window. 4. Enter your billing information, click next and the order confirmation screen will appear. 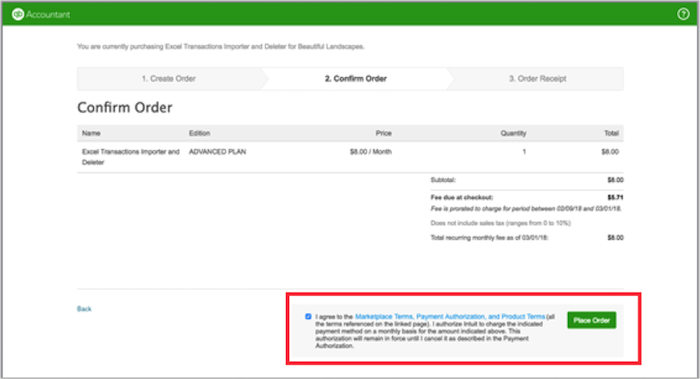 The new account is added to your wholesale billing once you agree to the terms and conditions and click Place Order. 5. When the order is complete, you will see an Order Receipt screen to confirm the transaction. 6. Click Done and you’re ready to activate and connect the app to your client’s QuickBooks company! You can view all your apps subscriptions by clicking on Your Account in the Gear in QBOA. Manage app subscriptions is found at the bottom of the Your Account screen. You can view your monthly invoices, edit your billing info and manage all subscriptions for you clients’ apps. 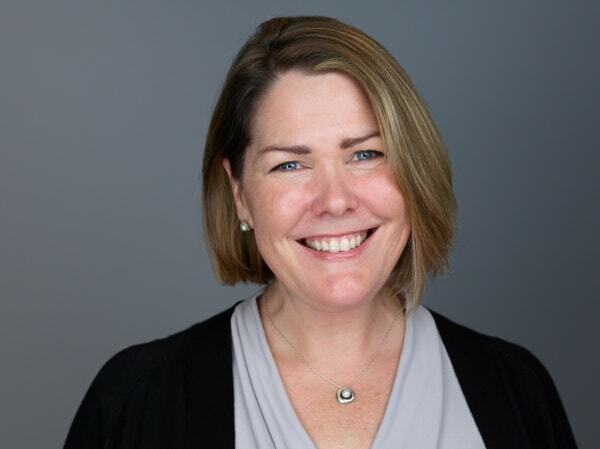 As more accounting professionals continue to leverage technology and automation to complete their work, it makes sense for them to bundle the costs of this technology into the services they provide to their clients. The new Accountant Apps program is certain to make it easier to keep track of these costs through consolidated billing with their QuickBooks subscriptions and other Intuit add-on services. It’s important to note that only the master administrator of the QBOA firm will have access to the Client apps screen and can add apps to the firm’s wholesale billing account. 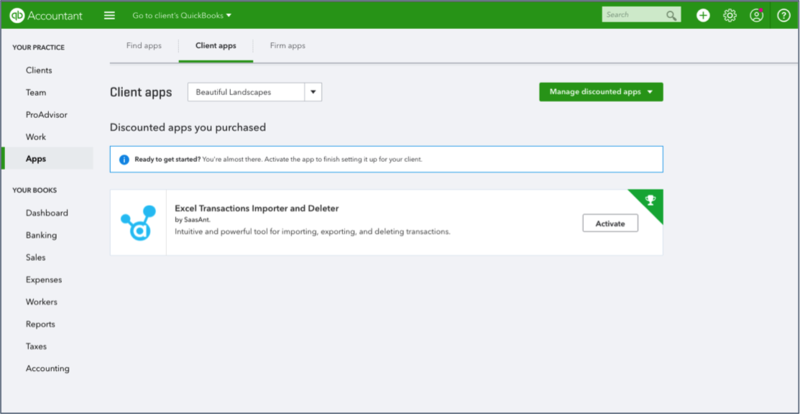 To learn more about apps permissions in QBOA and specifics about the App program billing, check out this support article. If you’d like to see the new Apps tab in action, check out The QB ‘Appy Hour with Liz and Heather on July 10 from 4:00 – 5:00 p.m., EST. We’ll be getting ‘appy’ showing you the new functionality and celebrating the magical world of the QuickBooks Online app ecosystem.